Welcome to Taradale House - Boutique Retreat & Garden Weddings's website. The information contained in this website is for general information purposes only. The information is provided by Taradale House - Boutique Retreat & Garden Weddings and whilst we endeavour to keep the information up-to-date and correct, Taradale House - Boutique Retreat & Garden Weddings makes no representations or warranties of any kind, express or implied, about the completeness, accuracy, reliability, suitability or availability with respect to the website or the information, products, services, or related graphics contained on the website for any purpose. Any reliance you place on such information is therefore strictly at your own risk. In no event will we be liable for any loss or damage including without limitation, indirect or consequential loss or damage, or any loss or damage whatsoever arising from loss of data or profits arising out of or in connection with the use of this website. 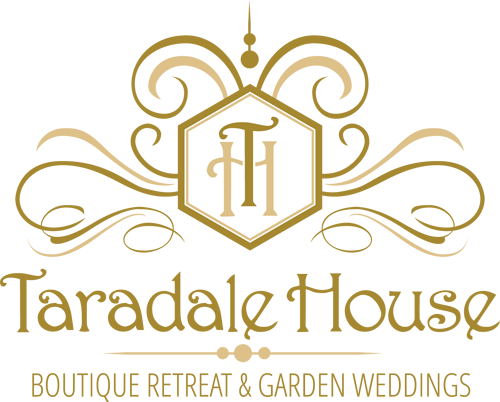 Through this website you are able to link to other websites which are not under the control of Taradale House - Boutique Retreat & Garden Weddings . Taradale House - Boutique Retreat & Garden Weddings has no control over the nature, content and availability of those sites. The inclusion of any links does not necessarily imply a recommendation or endorse the views expressed within them. 1. First Prize is 2 nights in the Orchard Cottage for 4 people, including continental breakfast provisions. 2. The Four runner up prizes are Serendipity Beauty Packs, of equal value. 3. Instructions on “How to Enter” form part of these Conditions of Entry. The competition is open to all residents of Australia and entries must comply with the terms and conditions of entering to be valid. This competition is not open to employees of the Promoter, their immediate families and agencies associated with this promotion, who are ineligible to win. By participating, entrants agree to be bound by these conditions. Entries must comply with these conditions to be valid. 5. To enter the competition, Entrants will be required to like the Taradale House Estate face book page and share a specially marked ‘win’ competition picture from the Taradale House Face book page to a personal face book page or another business face book page. Attendees at the Wedding Expo will be able to enter via electronic entry forms from the Taradale House expo stand on October 23rd at Melbourne Park Function Centre. 6. This promotion is a Game of Chance and skill plays no part in determining the winner. The winner will be selected randomly and announced on Thursday 17th November. The judge’s decision is final and no correspondence will be entered into. The Promoter will appoint the panel of judges and composition. 7. Taradale House Management staff will co ordinate with the 1st prize winner to book the accommodation. 8. The four runner up winners will post Runner Up prizes via registered mail to an agreed address. 9. Total competition prize pool is valued at $856.00 AUD. The 1st prize is valued at $540.00 AUD and the four runner up prizes are valued at $79.00 AUD each. 10. Judging will take place by Taradale House Management on the 16/11/2016. All valid entries received within the Promotional Period will be entered into the competition. 11. The winners will be notified via face book within 2 working days of the Judging and the names of the prize winners first name, suburb and or town, will be published on the Taradale House website at www.taradalehouse.com.au and via Taradale House social media platforms. 12. Prizes will not be transferable or exchangeable. 1st Prize will required to be redeemed by the winner within 6 months from notification of the prize being won, failure to redeem the prize will render it null and void after the 6 month period has period has passed. 14. It is the responsibility of the winner(s) to ensure the Promoter has the correct contact information. 15. The Promoter accepts no responsibility for late, lost, misdirected entries interrupted communications or unavailable network server or other connections, failed telephone, mid-delivery or computer transmissions or other errors of any kind, whether human, mechanical or electronic. 16. Except for any liability that cannot be excluded by law, the Promoter (including its officers, employees and agents) excludes all liability (including negligence), for any personal injury; or any loss or damage (including loss of opportunity); whether direct, indirect, special or consequential, arising in any way out of the Promotion, including, but not limited to, where arising out of the following: (a) any technical difficulties or equipment malfunction (whether or not under the Promoter’s control); (b) any theft, unauthorised access or third party interference; (c) any entry or prize claim that is late, lost, altered, damaged or misdirected (whether or not after their receipt by the Promoter) due to any reason beyond the reasonable control of the Promoter; (d) any variation in prize value to that stated in these Conditions of Entry; and/or (e) any tax liability incurred by a winner or entrant. 17. Subject to State and Territory law, in the event of technical malfunction or any other matter that interferes with or has the potential to interfere with the proper conduct of the promotion, the Promoter reserves the right to suspend, cancel, modify or terminate the Promotion. 18. All entries become the property of the Promoter. The Promoter (Taradale House Management) reserves the right to validate all entries. 19. Details from entries will be collected and used for the purposes of conducting this promotion only (which may include disclosure to third parties for the purpose of processing and conducting the promotion) and for promotional purposes surrounding this promotion. By entering this promotion entrants consent to the use of their information as described and agree that the Promoter may use this information, or disclose it to other organisations that may use it, in any media for future promotional purposes without any further reference or payment to the entrant. The Promoter does its utmost to ensure that your privacy is in no way compromised by these third parties. Entrants may access, change and/or update their personal information by contacting the promoter via functions@taradalehouse.com.au during office hours.